Will hear from you soon next week. I am visiting the West Coast (USA) this weekend. Staying in the vicinity of Los Angeles area. Any ex-BKs, or friend of BK/PBK posting here who wants to meet with me? No BK please. We can hang around and create some subject discussion. Truthfully, I have no physical ex-BK friends but a lot of BK friends. Please PM me. tinydot wrote: I am visiting the West Coast (USA) this weekend. Staying in the vicinity of Los Angeles area. Any ex-BKs, or friend of BK/PBK posting here who wants to meet with me? No BK please. We can hang around and create some subject discussion. Truthfully, I have no physical ex-BK friends but a lot of BK friends. Please PM me. Not this time, but hope to meet you some time in future. LA used to be one of my favored destination as a BK, appreciating the self-accepting atmosphere that Denise and Joan created at the time. Last time was rather different, driving around with jazz musicians instead of BKs. Hi ... Just dropped to say that I am going on a week long tour to Kerala http://www.keralatourism.org/ and going to my home city from there. I will back to Bangalore by 17th april. I might not have access to internet during these days, as my tour is in villages and do not like cities much. I will not be active on the forum during these days. I wish you happy holidays and journey. Hope you would enjoy the coconut water, banana chips, wonderful beaches and brackish waters and the boat rides. While we discuss God and spirituality, you would be enjoying the stay in 'God's own country'. That is how the Kerala Government describes Kerala in most of its official advertisements. have a safe trip! Can I contact you if I am going to Bangalore or Kerala sometimes this year? I know they have a good holistic therapy there. God appears where his children meet, says Avyakt BapDada. So the meeting of those who've gone beyond the BKs will always be the most elevated. People who have accepted themselves, including their deepest nourishment and wants. Clearly those of us who accept ourselves fully are the masters. The rosary is not going to be made of people wondering if Dharma Raj will make her suffer. Those will no conscience will not suffer. The ones with conscience who nevertheless persecute themselves will suffer. Those to who Dharma Raj is no longer fearsome, are the rosary of victory. Many are happy with fullfilling relationships. They do not expect to meet a person's standard of perfection, to present themselves as anything more than human. Nor to explain or apologize for themselves in any way. These are the 'children of God' I'd like to meet. God would always accept one of his human children of any age taking his life and own body in his own hands. God would accept all healthy mammalian behavior in his children. It proves that Shiv Baba is not God that he doesn't approve of healthy mammalian relationships among his "children". This thread provides a place carry travel news, as a way of ex-BKs meeting each other, perhaps one day an ex-BK convention. God would have a higher than average chance of being with us. I'll be in Chicago in May, if any ex-BKs will be visiting Windy City. I never heard of a center in Chicago. West coast from July. Just writing to say Hi and to let you all know that Pauly is off to sunshiny Mozambique on Wednesday morn to have some fun in the sun and to swim with wild dolphins in the warm Indian Ocean. It's part of our retreat programme we run twice yearly and I cannot wait. 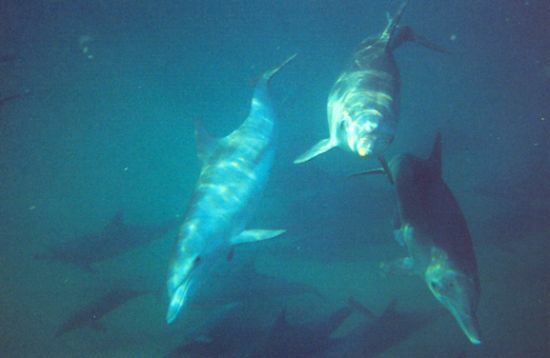 Anyone who's ever swum with these amazing creatures will truly remember a most life-changing experience. I am really hoping we'll get the opportunity of swimmng with a Whale Shark! Be back early next week and will tune in at that time, until then happy days to all. Thank you Arjun Bhai, Abramakumar and tinydot for your wishes. arjun wrote: While we discuss God and spirituality, you would be enjoying the stay in 'God's own country'. It was indeed God's own country...the state is green all over or atleast most the places I visited. I can write something on my trip. I saw a mail from Admin on board changes and introduction of blogging. Maybe I can put some information there..
tinydot wrote: Can I contact you if I am going to Bangalore or Kerala sometimes this year? I will be traveling in Scandinavia for the last 2 weeks in May. There will be the occasional opportunity for me to check in on you all from there, but I need a proper holiday, so I doubt if I will post much. proy wrote: I will be traveling in Scandinavia for the last 2 weeks in May. OK. That's me flying off tomorrow. See you all in June. I'll be away from the 25th May but just for a week. Off to Thailand again. Lovely place ... and no, Bro Neo, I won't be going to Pattaya (well, not this time anyhow ). But considering I am completely addicted to the internet, I will probably find a cyber cafe where ever I am. That's me back home in Scotland, strangely to a lot of emails from the BKs in my inbox and letters in the mail, advertising their programs. I had thought that all that had stopped, but no. Also my wife dreamt about them again last night - a long dream. So, we are still a bit tired from the vacation and the traveling, so I will be reading more than writing for a few days. Speak soon.